If you have always aspired to have your own hole, a small German town can make your dream come true. 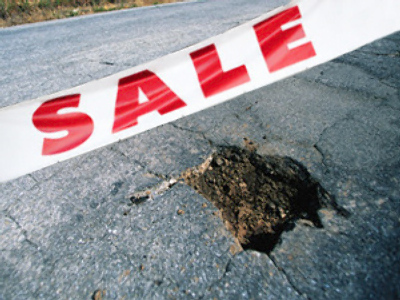 A small village in eastern Germany will sell potholes to finance the repair of its roads damaged by severe winter frost. The official site of the village offers a wide range of holes for €50 ($68) each. In return, the local authorities promise to fix it and place on its top the buyer's name and a message of their choice. So far, the holes have sold like hotcakes – television channels and newspapers immediately jumped on the idea, hoping to advertise and make people associate their brands with high level of social responsibility. Village officials and local residents have also readily supported the initiative. The idea could catch on. Experts say that months of severe winter weather have badly damaged as many as 40 percent of Germany's roads. According to the German Drivers Club, local authorities will need more than €3 billion to fix the situation – a huge sum given the recession.